Are Surveillance Cameras Important For Bars And Clubs? In recent years, security cameras have become commonplace in most public settings. They can be found in government buildings, banks and stores. 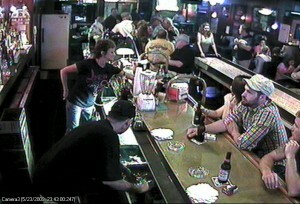 Increasingly, bar and club owners are also installing surveillance cameras to protect patrons, employees and assets. After surveying recent discussions in bars and clubs that have taken place throughout the United States, this article will explore the advantages and disadvantages of installing cameras. It will conclude with a brief guide on the different types of cameras available. Over the past five years, local governments have taken up the issue of installing security cameras in private establishments. In some cases, this debate occurred at the state level. At other times, laws were proposed by local municipalities. Chicago was the most well-known municipality that considered requiring security cameras specifically in bars and clubs. Richard Daley, a former mayor of Chicago, wanted to require security cameras in bars that remained open until 4:00 a.m. or later. His hope was to eventually extend this requirement to all business open at least 12 hours a day. Other city governments, like Milwaukee and Baltimore, have proposed laws that would require private businesses to install surveillance equipment, but Chicago specifically targeted establishments that served alcohol. Ultimately, the laws of Chicago, Milwaukee, Baltimore and other city councils have no effect on bars and clubs outside their jurisdictions. By proposing their respective ordinances, however, these cities started a national debate. Local residents and national organization, such as the ACLU all weighed in on the advantages and disadvantages of installing surveillance equipment in bars and other private buildings. Before delving into the advantages and disadvantages for bars and clubs, the political debate surrounding security systems and government must be mentioned. There question at hand is: “Should governments, whether local, state or federal, be able to force business owners to install surveillance equipment?” There are those who affirmatively answer the question and those who negatively respond. The political aspect is beyond the realm of this article, but influences some of the following issues. When asked to weigh in on the debate surrounding security cameras in bars and clubs, most people have a pre-conceived opinion. They tend to examine only the positive aspects of installing cameras or the negative ones, whichever support their position. A fair look at the issue, in contrast, will look at all the issues involved. In a few cases, bars and clubs must install security cameras to comply with local laws. In these instances, an establishment’s liquor license can be forfeited, if cameras are not installed. Regardless of one’s personal opinion, placing security cameras in strategic locations is clearly the best choice when local laws demand it. Keeping a business’ doors open is much better than having the police close them. Also with regard to laws, business owners should be aware of federal laws regarding security cameras. The national government has not passed a law specifically about security cameras in drinking establishments, but the legal community generally recognizes understood areas of privacy, such as locker rooms, changing rooms and rest rooms. Under no circumstance should a business install security cameras in a restroom, although they may monitor who enters and leaves a restroom. Placing a camera within a restroom is not only morally reprehensible, but it also opens the company up to lawsuits and other legal trouble. The primary reason any company sets up surveillance cameras is to protect people, both customers and workers, and assets, both goods and equipment. This is no different for bars or clubs. Security cameras are installed in these places to protect people and assets. If this is not the sole reason for installing cameras, it is at least the primary reason. Security cameras provide protection in one of two ways. First, visible cameras can deter people from committing a crime. People are less likely to abuse another person, vandalize property or steal goods if they know a mechanical eye is watching them. Second, cameras are also a source of evidence after a crime has been committed. Their video tapes are regularly used in court to establish the guilty party who should pay restitution for a crime. The role a camera will have in a security system influences which type of camera should be selected. This will be discussed in the final section. The most common argument proposed against installing security cameras in bars and clubs pertains to privacy issues. As stated above, businesses cannot install cameras in explicitly private areas, like restrooms. Some people, however, feel that the entire bar or club should be considered private. Patrons claim they go out to have a drink and relax, and they have trouble relaxing if someone is watching. Undoubtedly, everyone can empathize with this argument. For instance, it is difficult to sleep, which is a form of complete relaxation, if one knows someone is peeking through the bedroom window. This argument, however, only applies in places where people expect privacy, such as their home. In today’s public culture there is no pirvacy. People are used to being watched. The days of being surprised by someone shouting, “You’re on ‘Candid Camera,’” are long gone. Everywhere people go, surveillance cameras are watching them. People have become used to this. If a security camera is not watching, then someone is nearby with a cell phone and ready to video tape anything that happens. Outside of one’s home, anything can find its way to YouTube or Facebook. Bars should not worry about violating people’s sense of privacy by installing security cameras, because any sense of privacy has been lost. Another disadvantage of installing a security system is the cost associated with it. This is a minor disadvantage compared to the above two issues, but it is worth mentioning. Cameras, wires and recording equipment all cost money to install. A monitoring service, which is optional, can increase the bill of a security system. When considering the costs of a security system, business owners and managers must weigh the risks and the rewards. A security system can be viewed as an insurance policy. In fact, many insurance companies give discounts to companies that actively monitor their facilities. No one can make the final decision for a business owner or manager. He or she must bear that responsibility. Thankfully, equipment can be found for very little – even cheap dummy cameras can be effective. In most cases, the question is not whether to purchase a system, but how extensive a system to purchase. Having examined the arguments both for and against installing security cameras, it is clear that every drinking establishment should have some surveillance system. Businesses should want to care for their customers and employees, and it is in their self interest to protect equipment. Any sense of privacy people used to have in public is now gone, so it cannot be violated. Finally, thanks to some inexpensive equipment, every company can afford at least a small system. Although they may recognize the need for a security camera system, many bar and club owners struggle when shopping for one. They are familiar with running a business, not with the fine details of surveillance equipment. The following is a brief guide to surveillance equipment. Visible security cameras are prominently displayed to remind people they are on television. These are installed to deter crimes. In some cases, such as dummy cameras, that is all these cameras do. Most of the time, though, visible cameras also record activity, either to a VHS tape, DVD, hard drive or company account online. Although visible security cameras are meant to be seen, they do not have to be ugly. Everyone is familiar with the large, unsightly cameras used in warehouses. Thanks to modern technology, cameras do not have to be as large as this. Small cameras can easily be worked into any décor, without significantly detracting from the atmosphere. In general, the public does not enjoy being secretly watched. Therefore, most bars and clubs shy away from these surveillance tools. Some businesses, though, use these in employee-only areas where money is kept or handled. Depending on a bars or club’s atmosphere, it may be necessary to install infrared cameras. In dimly lit rooms and outdoors at night, infrared cameras can capture things regular ones would miss. This vital data in some cases is the difference between convicting a criminal and watching him go free. Fixed security cameras focus on a single area. Anything that happens outside their field of view will go undocumented. These cameras can be used effectively to watch high-risk areas, such as a cash register or safe. They can also be positioned on and entryway or exit. In contrasted to fixed cameras, PTZ security cameras can pan, tilt and zoom. Some of these must be manually operated, while others are fully automated. Because of the advanced technology in these devices, especially in the automated ones, they are more expensive than simple fixed cameras. They however, have much greater capabilities than their simpler counterparts, and in the right situation, PTZ cameras are a wise investment. With all of the options available, every bar and club should be able to find a security camera system that meets its needs and budget. When looking for a company to install the system, restaurateurs should seek out a company that will explain the various options. The best security company will take the time necessary to develop a comprehensive, customized solution to a bar’s needs. Contact us today for a free quote.